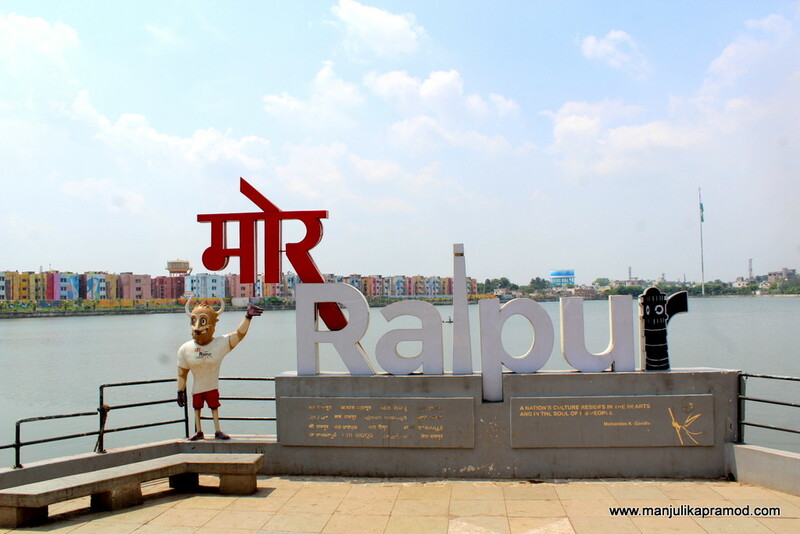 Let me introduce you to Raipur! This was my first touchdown in Raipur in Chhattisgarh state and I was pretty excited. I was headed to cover the 34th edition of Chakradhar Samaroh, a 10 day festival in the Raigarh district, in Bilaspur Revenue Division. 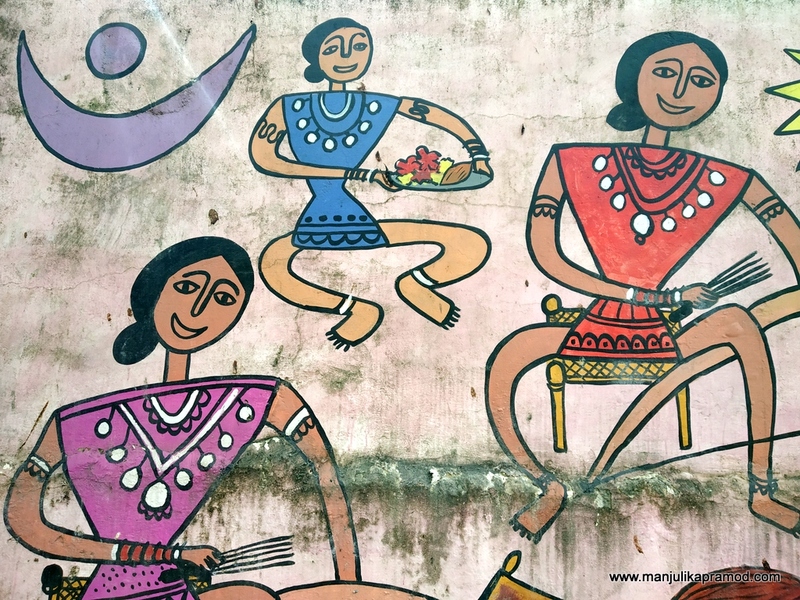 For the uninitiated I must tell you that Raigarh is famously known as the cultural capital of Chhattisgarh. There is no direct flight to Raigarh and thus the itinerary was planned through Raipur. Both onward and on my return, I got to spend a couple of hours on each day and this helped me to make my first impressions of the capital. 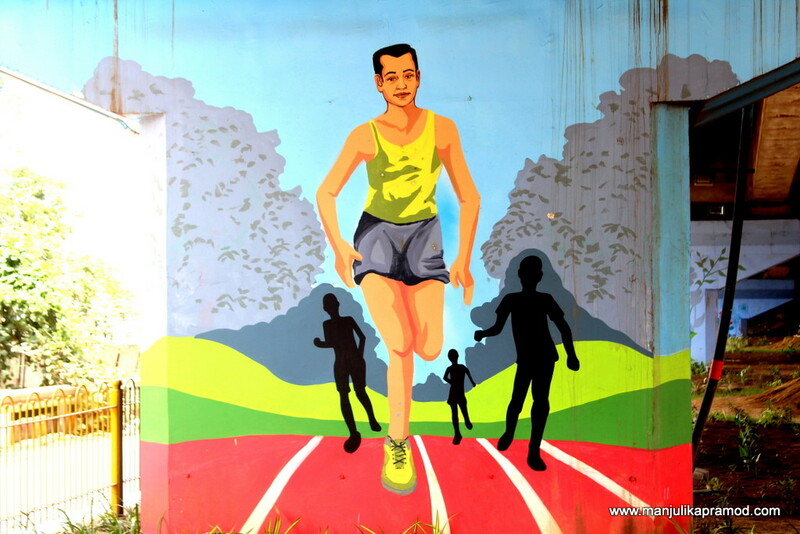 This post is about helping you to explore Raipur from my eyes. Interestingly, I also got a chance to touch upon the area which was formerly known as Naya Raipur and now has been renamed as ‘Atal Nagar‘ in honour of our former P.M., Atal Bihari Vajpayee. In recently concluded Innovation Summit in Delhi, Naya Raipur was presented as the nation’s first planned smart city of 21st century. A selfie point at Marine Drive. 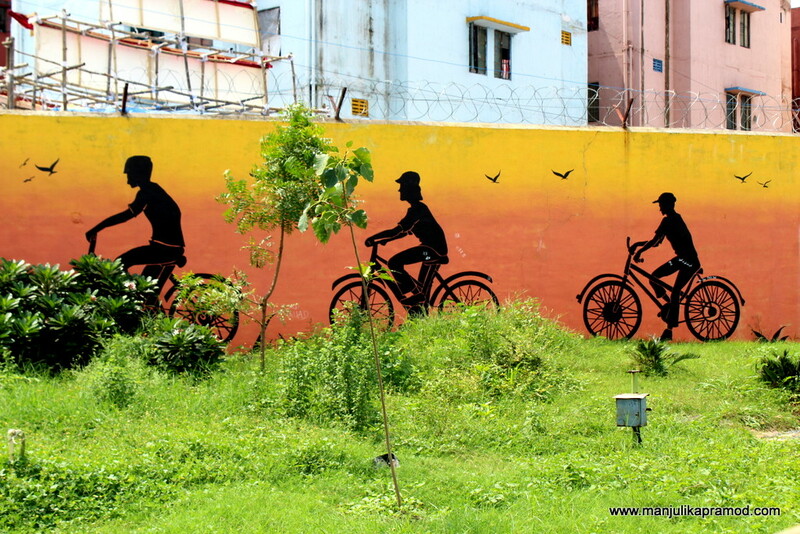 Some fabulous street art made my day in Raipur. The airport has state-of-the-art facilities and is very well maintained. I was aware that in 2015-16, it had been awarded as one of the best airports of India for customer satisfaction and facilities offered. 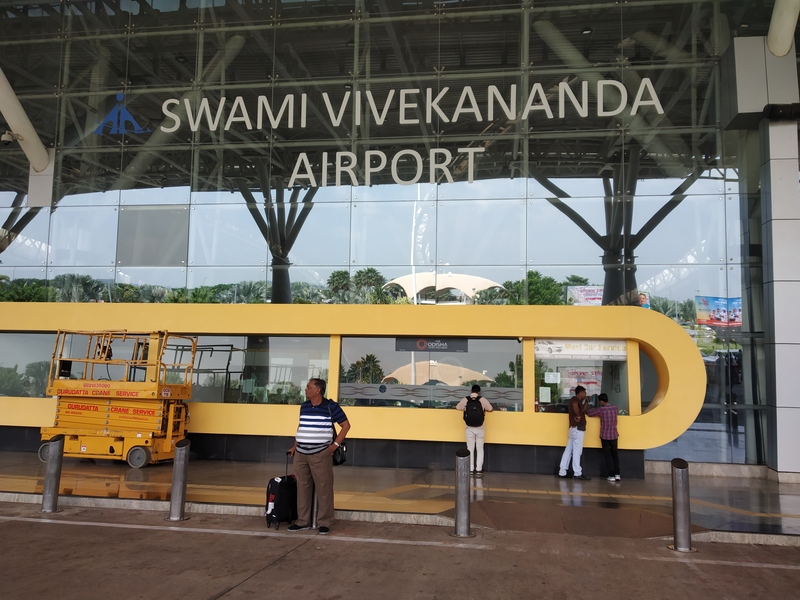 As far as the name is concerned, all that I could learn was that it has been called Swami Vivekananda after the famous Indian sage Vivekananda who spend a few years of his life in the city. I was met by a local driver who was supposed to take me to a hotel for few hours, before my train to Raigarh. I told him that I was not very keen to go to the hotel rather wanted to see some interesting places. 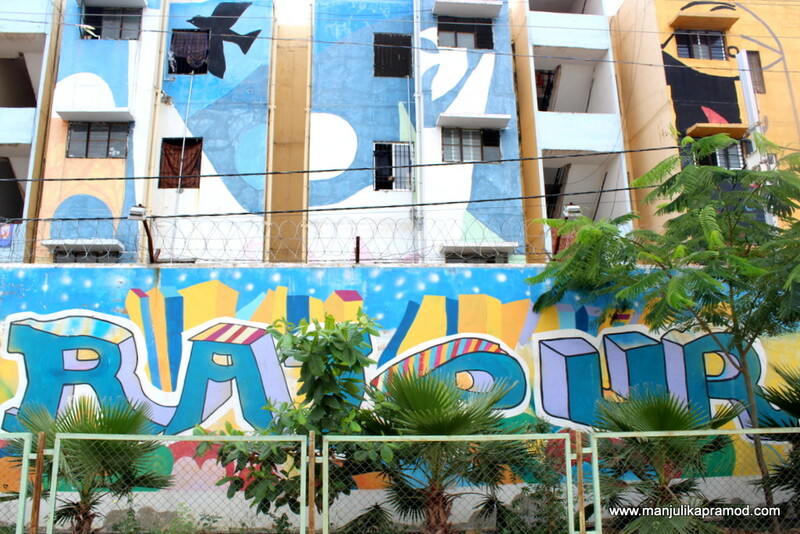 I had no idea about the city and also shared about my interest in colorful painted walls. 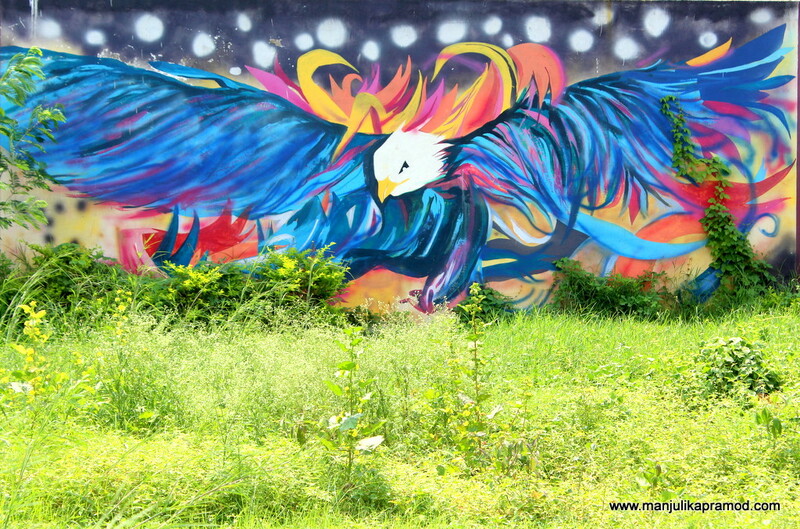 I was not sure if he understood street art and graffiti but to my surprise, he quickly came back on it and said ‘I will take you to the right places, you will love them’. I loved his confidence. 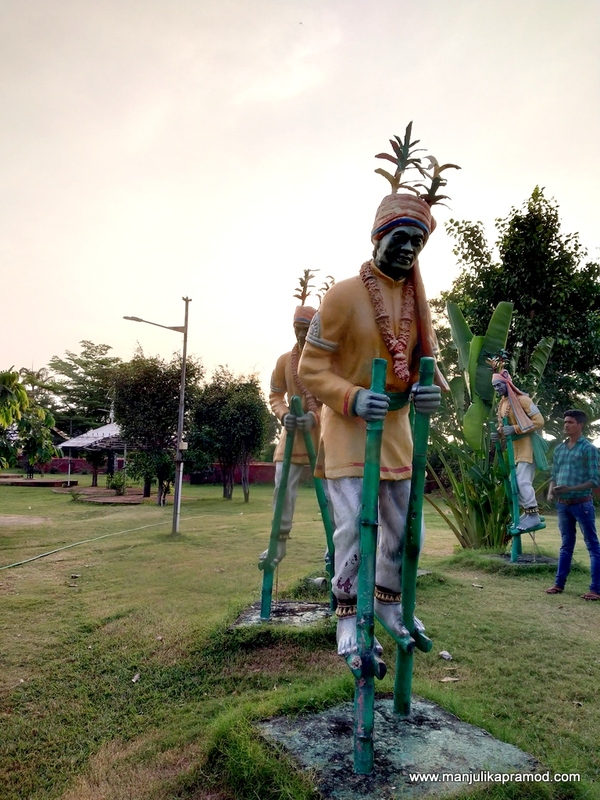 Just outside the airport, the city seemed slow and dull but after driving for around twenty minutes, he stopped at a selfie point which read ‘Mor Raipur’. 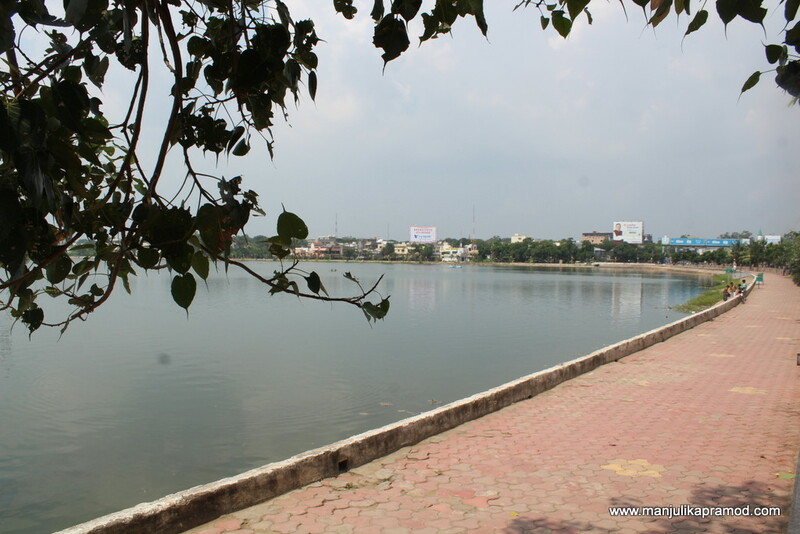 He introduced it as the Marine Drive around Telibandha lake. I could easily conclude that this must be a popular place among the locals to spend their evenings and holidays. I got down to click pictures and there my lenses caught a shot of the colorful houses and an open art gallery at the far end. 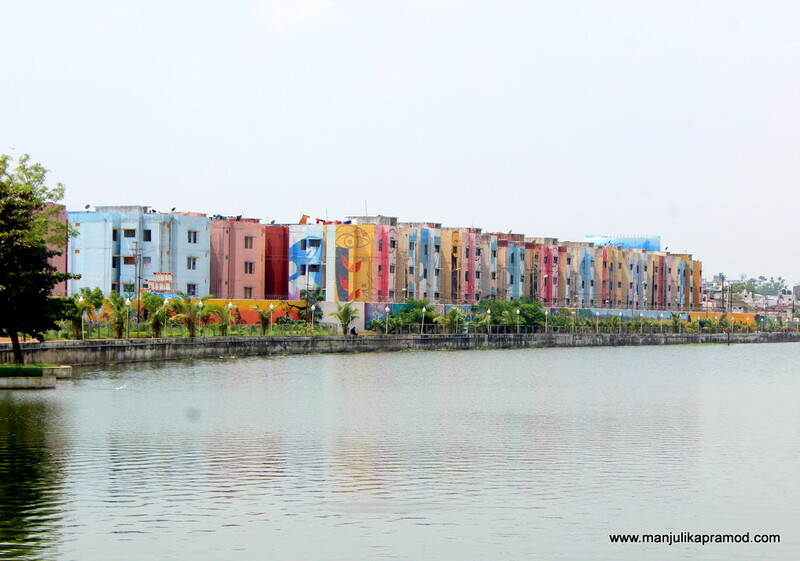 With no second thoughts, I requested him to take me closer to the colorful houses. 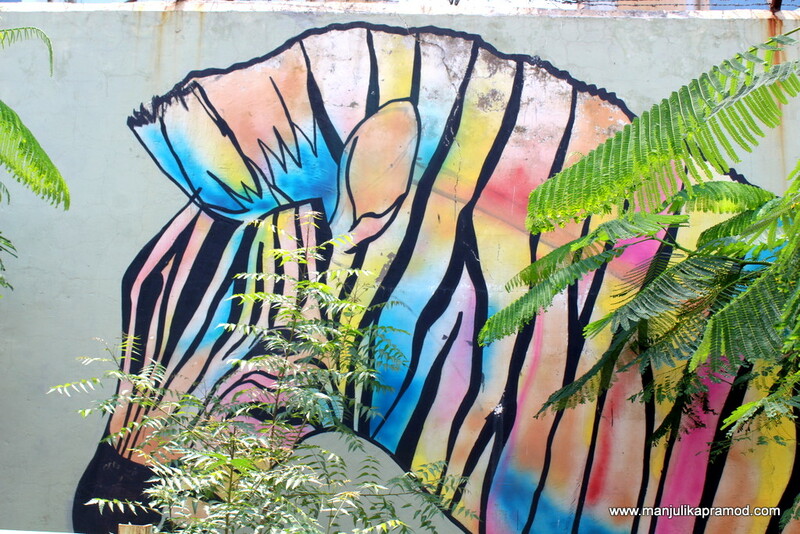 Since it was more of a walking area, I decided to tread down and check out the walls splashed with vibrant colours. I must applaud the idea of painting the towering government apartments on one side of the lake. These flats made for an amazing backdrop to the stretch of paintings. 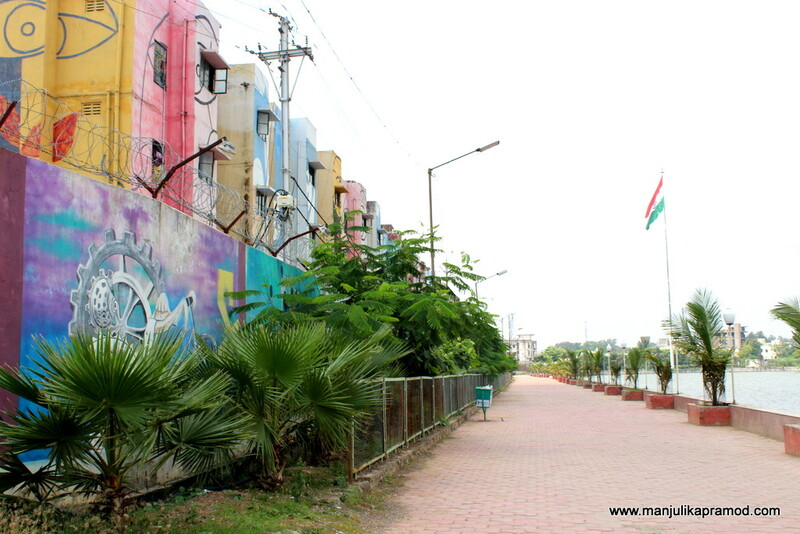 The blue sky, ducks floating in the lake on the side, a huge flagpole with the National flag, a Gurudwara across the road, lots of graffiti, all of this and more right in the heartland of the city gave me a good impression of the city. 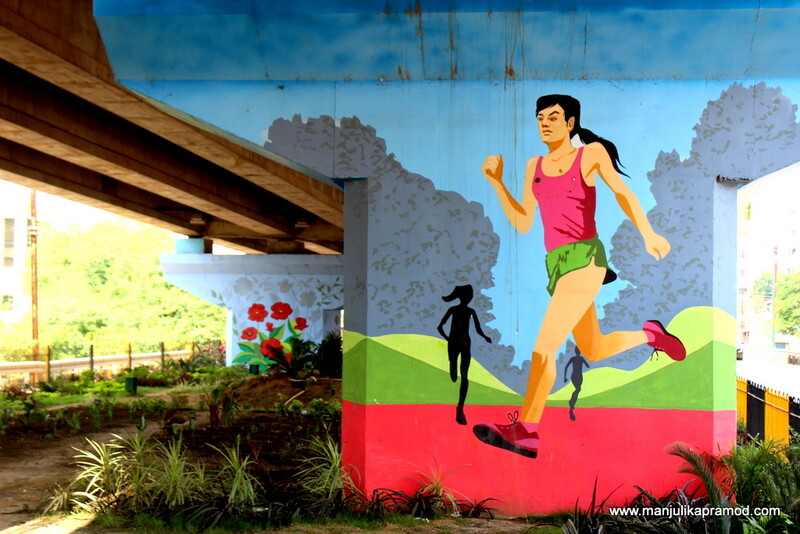 These graffiti and murals were exemplary of fabulous work and how wall art can transform a dull corner. So delightful. This is my favorite pick from the lot! Whats yours? 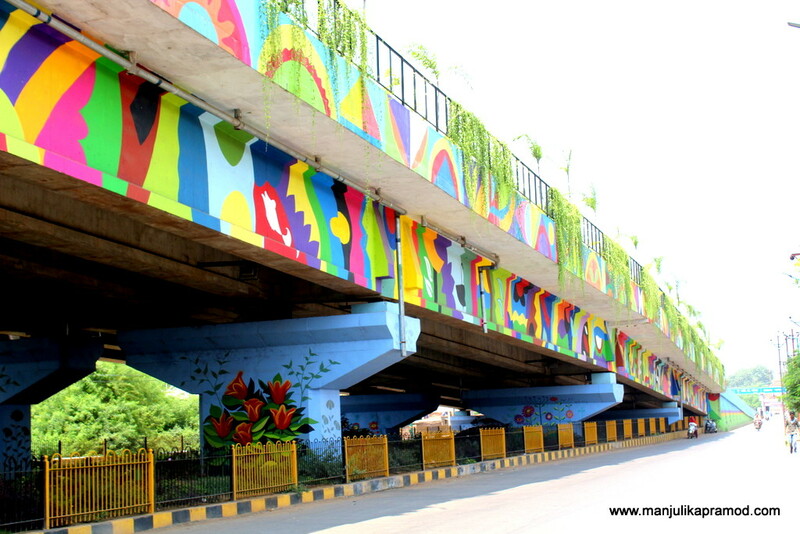 I had heard about Chhattisgarh’s first green fly-over but did not know that it had come up as one of the most vibrant bridge, decorated with beautiful murals and graffiti. This state-of-the-art flyover looked bright and beautiful under the sun. This was truly very exciting for my travel and art section. 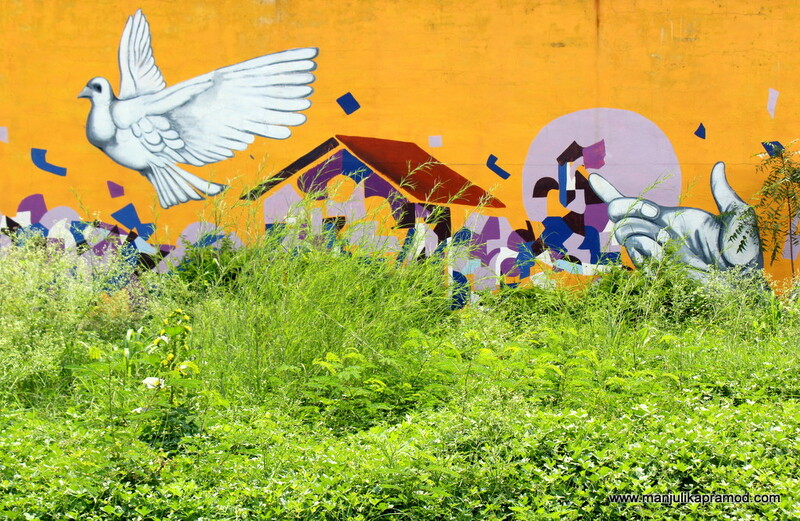 I feel this street art culture should be utilized more for city beautification. Raipur is definitely using it smartly. 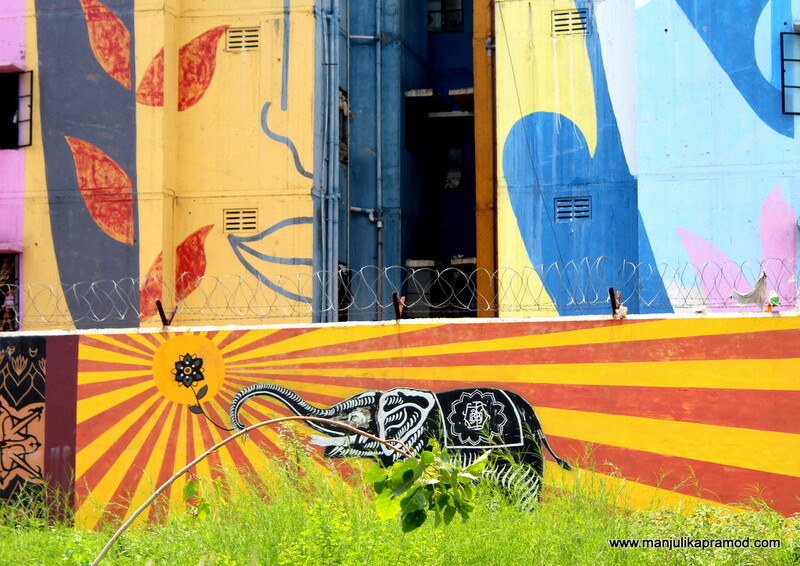 One day, India should be known for its street art. When I looked at my watch, I realized that there was not much time to go for the museum and other attractions, I asked the driver to drop me to the hotel. I had to freshen up and drive down to the Railway station in the next two hours. On the way, he kept filling me with the tid-bits of the city. I saved the information for the other day when I was coming back again. 3 days later…. the exploration continued! I was back in the capital after attending the 5th and 6th day of Chakradhar Samaroh 2018 with a wholesome experience of the musical festival and Raigarh’s neighborhood. 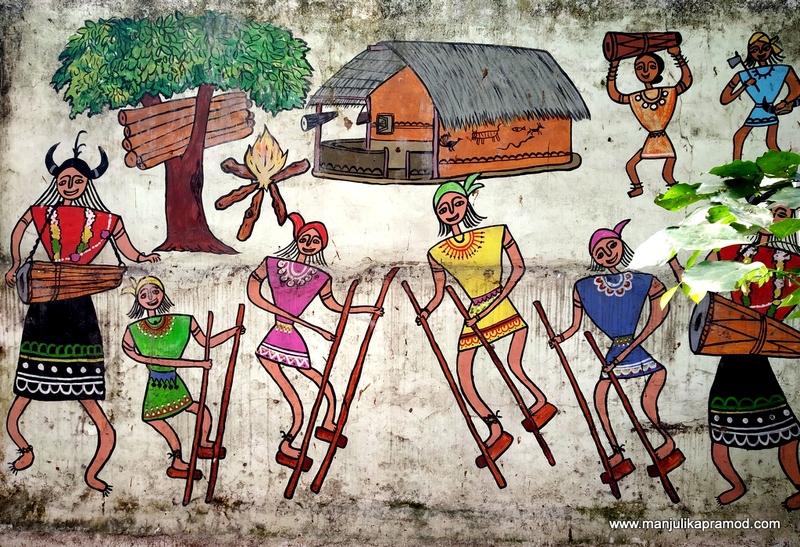 The rustic beauty of Chhattisgarh had won my heart. This short and sweet trip of 4 days was a good start to pique my interest around the hidden gems of this tribal state. I was definitely keen on returning back soon. Before my flight back to Delhi, I touched upon a few more places in Raipur and had one of the best food experiences. If you are looking for good place to eat, just head to Gad Kalewa to dig into some interesting delicacies of the state. Take my words, you will not be disappointed. 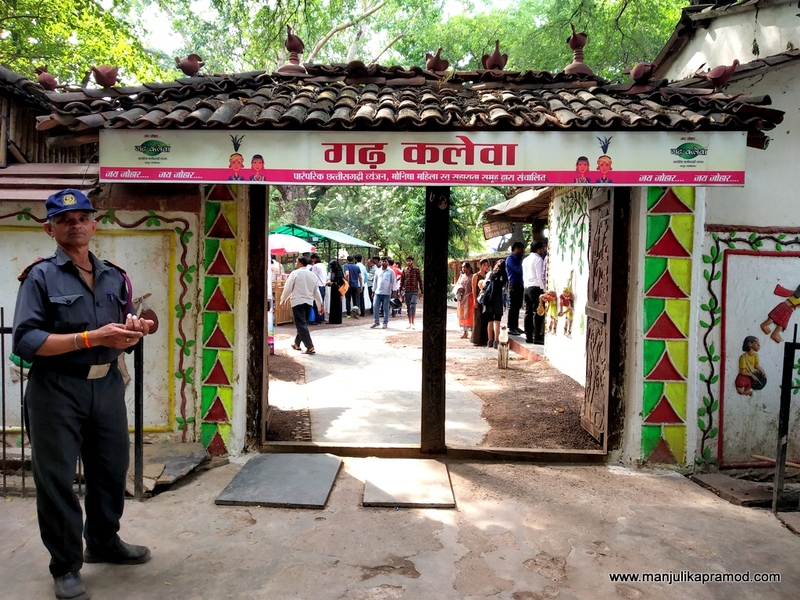 If you are looking forward to savoring Chhattisgarhi cuisine, just head to Gad Kalewa. Gad kalewa is an open-air eatery with a basic set up. With traditional style of seating, it makes you fall in love with its ambiance almost immediately. Words will not do justice to this place, I must show you the pictures of the food to tempt you and make you curious. 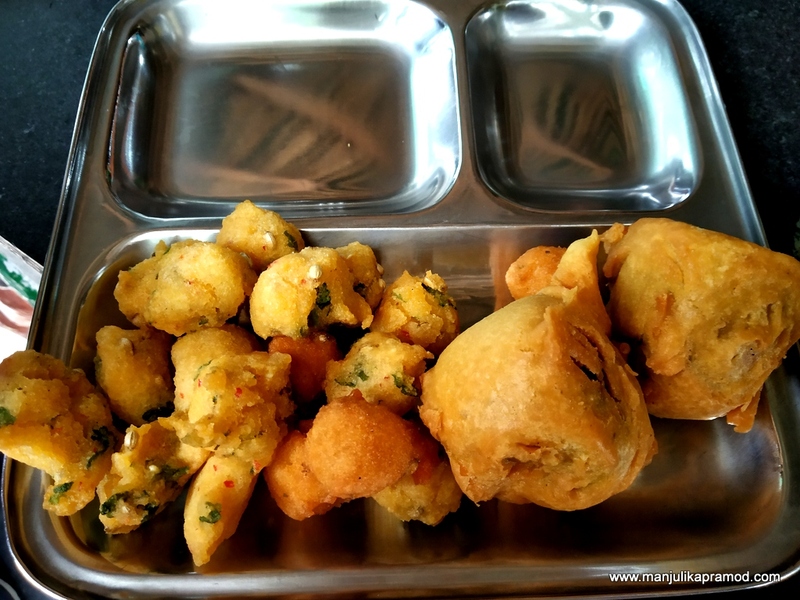 This is one of its kind place in Raipur which not only serves authentic local cuisine but also acquaints you with a variety of Chhattisgarhi vegetarian snacks, drinks and complete platter. There were many dishes which I had not even heard of. I also loved the simplicity and sincerity with which everything was being served. 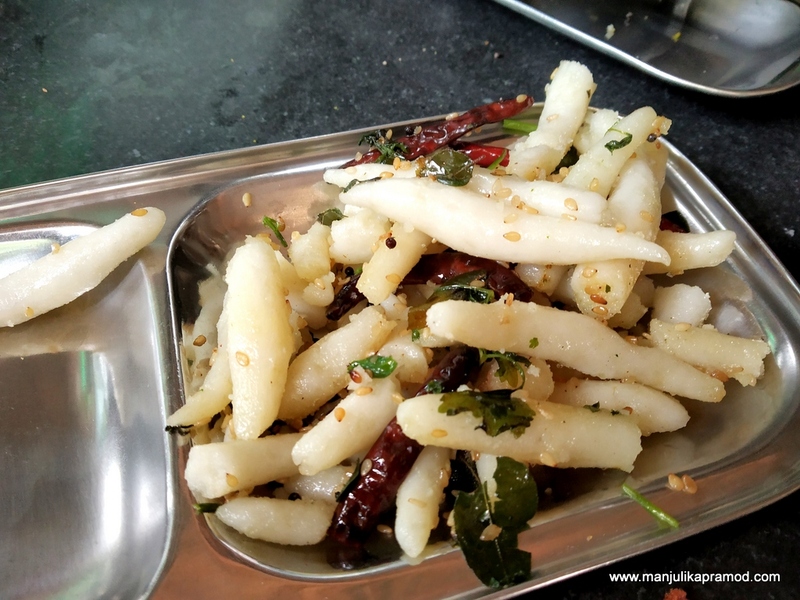 Some of the dishes that I ate for the first time are Fara, Pitthiya, Bafori, Dhuska, Mara Peetha, Paan roti, Babra, Aersa, and there were two dozen more items on the menu. 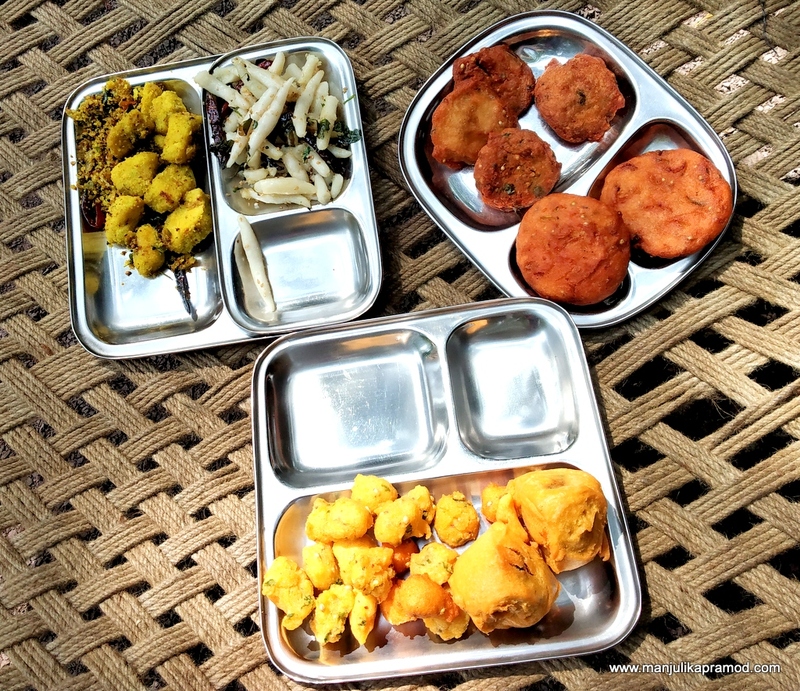 The idea of making everyone aware of local cuisines is the strength of this place. And there is absolutely no compromise on taste. 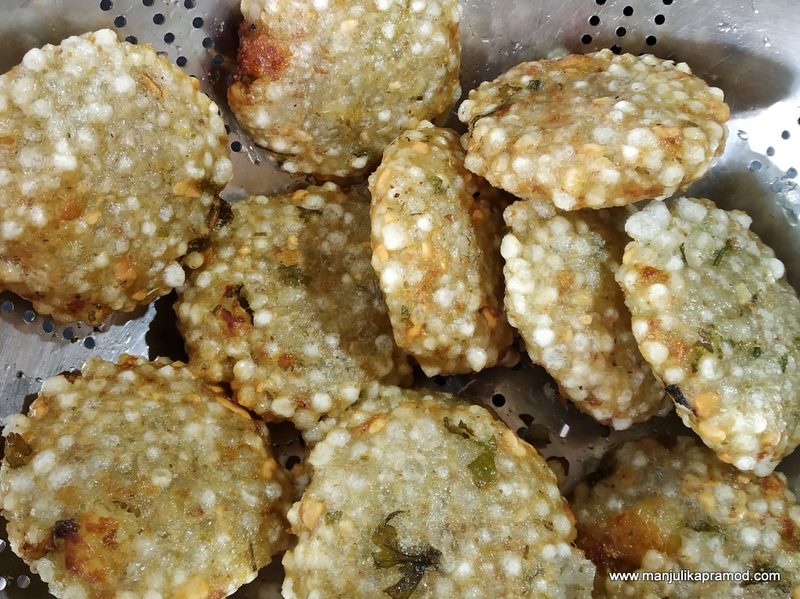 I may not be the right person to claim this since I have not eaten these things in the local houses or villages but everything that I tasted or ate pampered my taste buds. 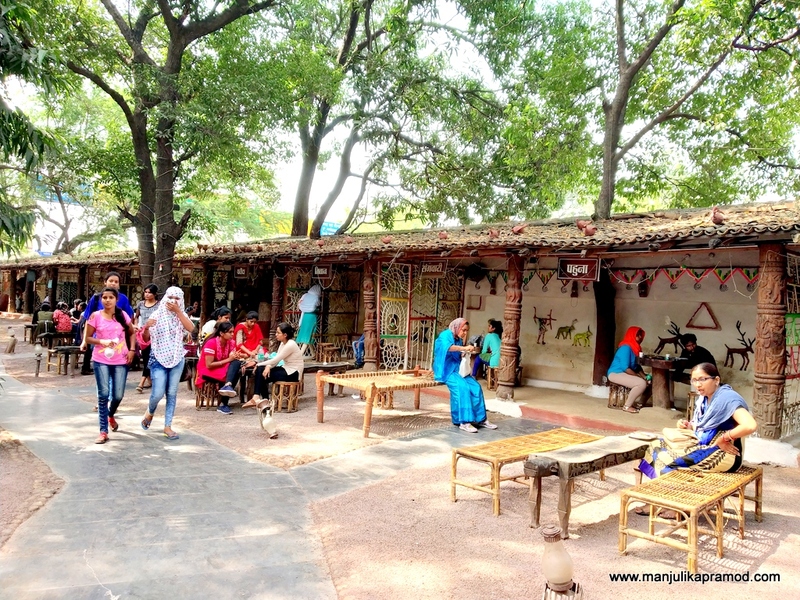 The fact that it was buzzing with crowd on a weekday afternoon was an assurance that it was popular among the local crowd. Honestly, I dint want to leave the place because I wanted to eat more but I was full. Also, I must insist on the fact that everything was very tasty, fresh, clean and sold at extremely low-price. 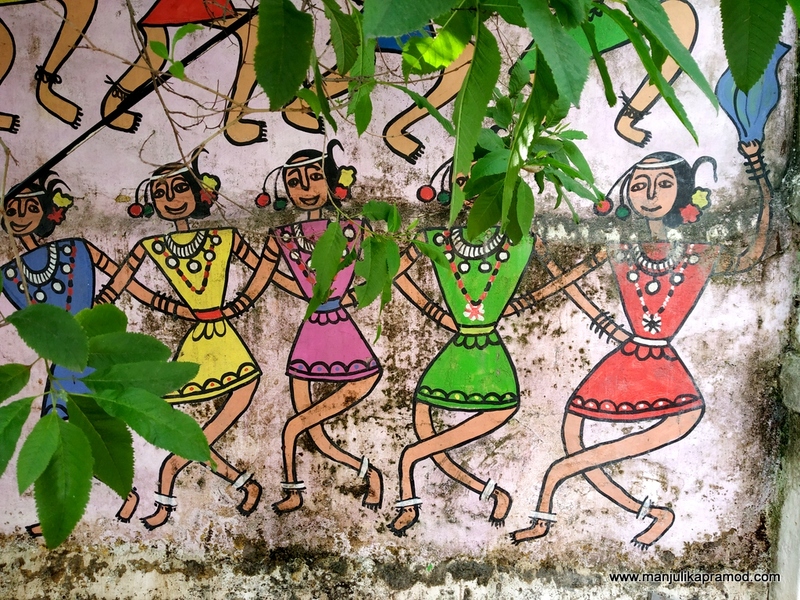 And before you leave the place, don’t forget to look out for some of these beautiful and colorful traditional drawings on the walls behind. 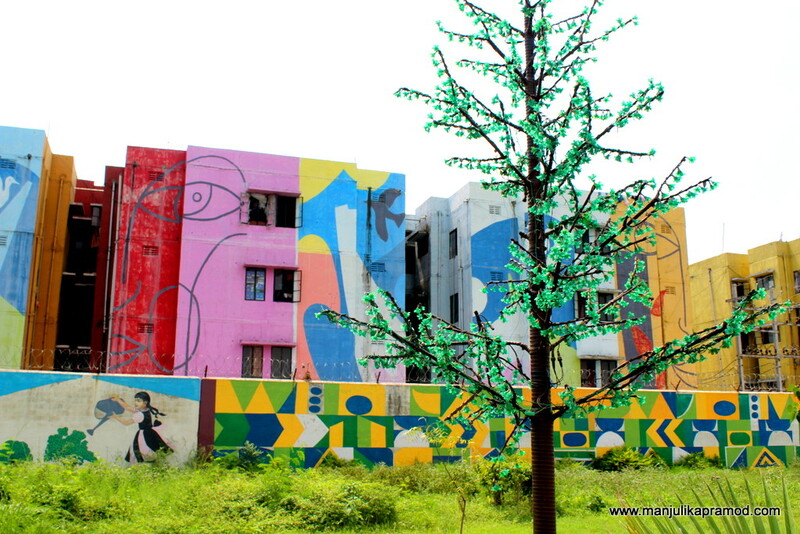 This special park is an open museum and it was inaugurated by Hon’ble A.P.J Abdul Kalam. 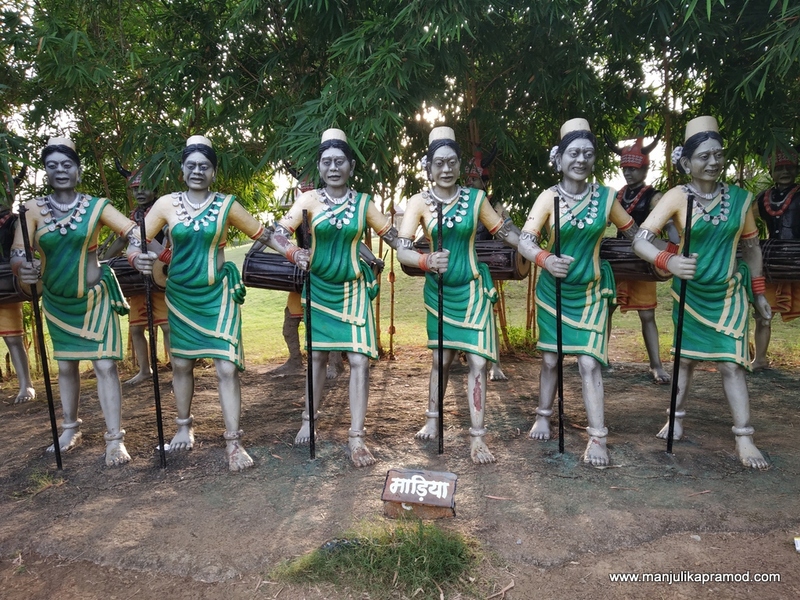 It covers a huge expanse of land and tries to show various aspects of Chhattisgarh. 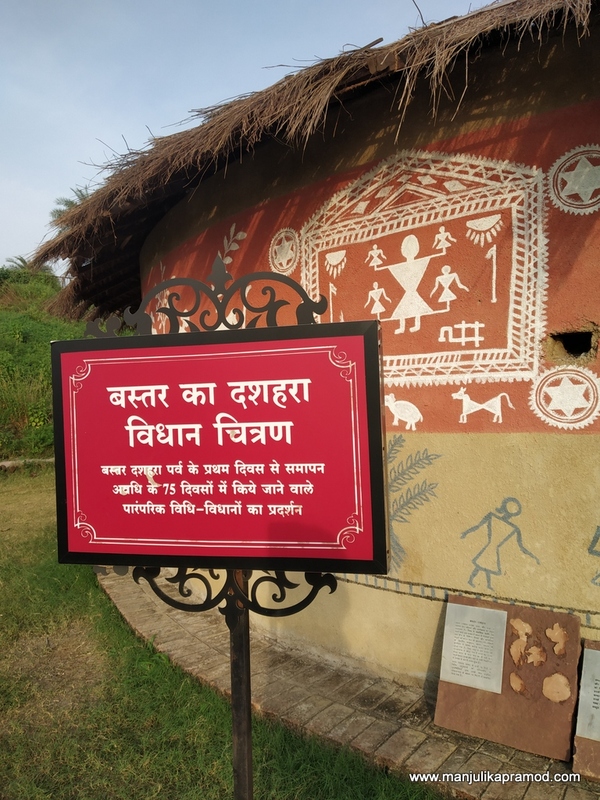 It is quite a novel idea to showcases the art, craft, architecture, temples, famous people, tribals, murals, dances, festivals of the state with miniatures and model structures. I learned a lot of things while walking around. A nice place for kids too where they can see and ask questions. 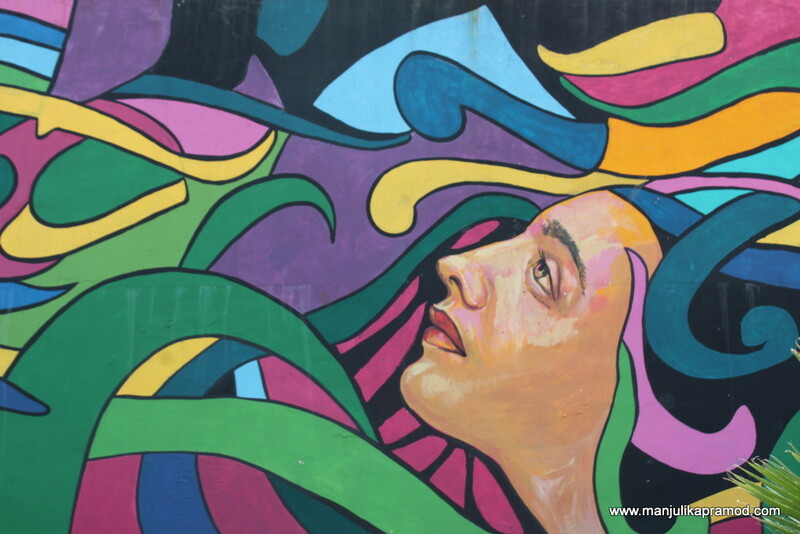 I was also quite happy to see wall art all around. It just made things all the more interactive and interesting. If you wish to peek into everything, absorb things at your own pace and walk from one side to another, you got to spend some time here. There are gardens, places to sit down, climb, relax and more. 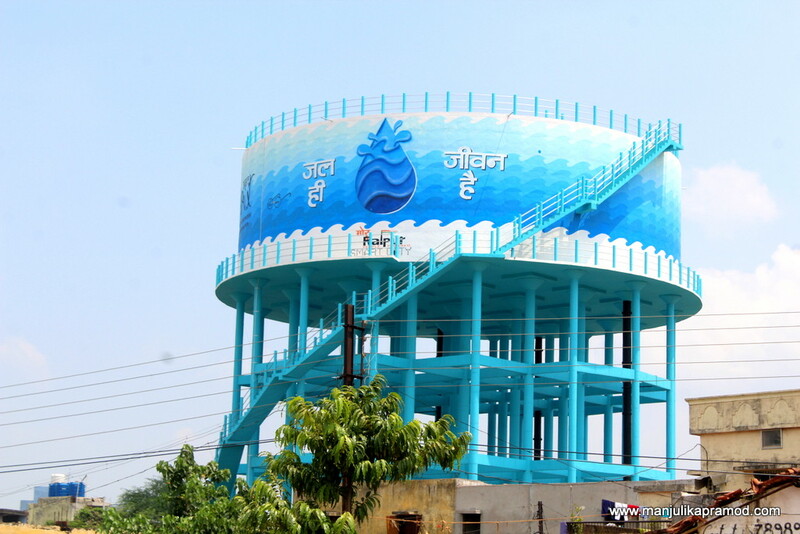 I am sure it makes a good place for outing for families and someone who is visiting Raipur for the first time. As facts would have it this is the second biggest international stadium of India and fourth largest in the world, really? I had no clue until I googled about it. I am sure we will hear about more matches taking place in here in future. New Raipur or Atal Nagar has really come up very well. By the time I wrapped up this, it was time to reach the airport. 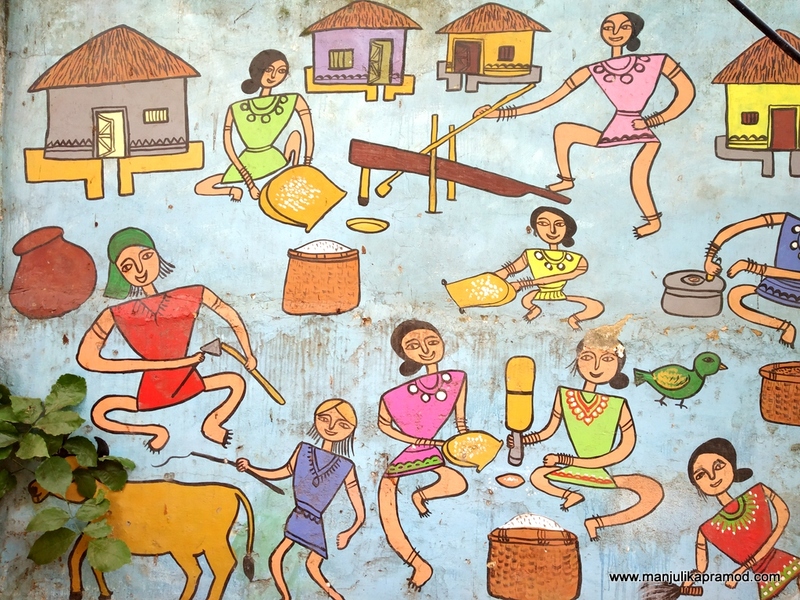 Do follow my next story around Raigarh. 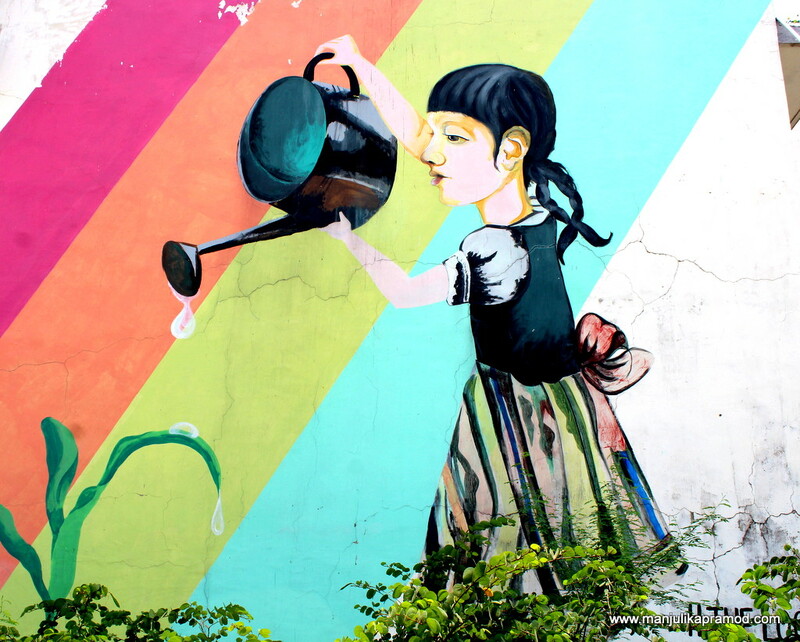 Now that is definitely one city that promotes street art. I had no idea Raipur is so beautiful. I have passed through the city couple of times, but never actually stopped there. Haha..
Nicely described about Raipur with all details…. Your write-up attracts me to visit Raipur. It’s so excellent the way it has been described.. 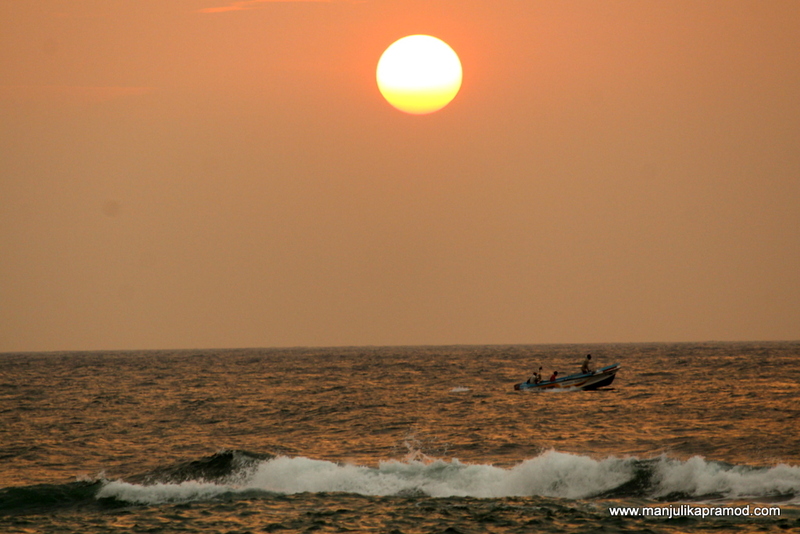 Thanks a lot for the appreciation and golden words for the Gad kaleva n marine drive and wall arts etc. Hope you liked the people too…who are so simple in living and always loves the guest.